Here you are using a true “New World” crop. Banana squash seeds were discovered from an archeological site in Peru. In 1893 R.H. Shumway of the seed catalogue fame introduced this squash to us here in this country. This squash requires long periods of warm season weather to reach maturity and often stays on the vine for up to 120 days. Therefore, it requires over a half-year to cultivate and makes for just one single crop annually. With that in mind, let’s really give respect to this very healthy and delicious squash. 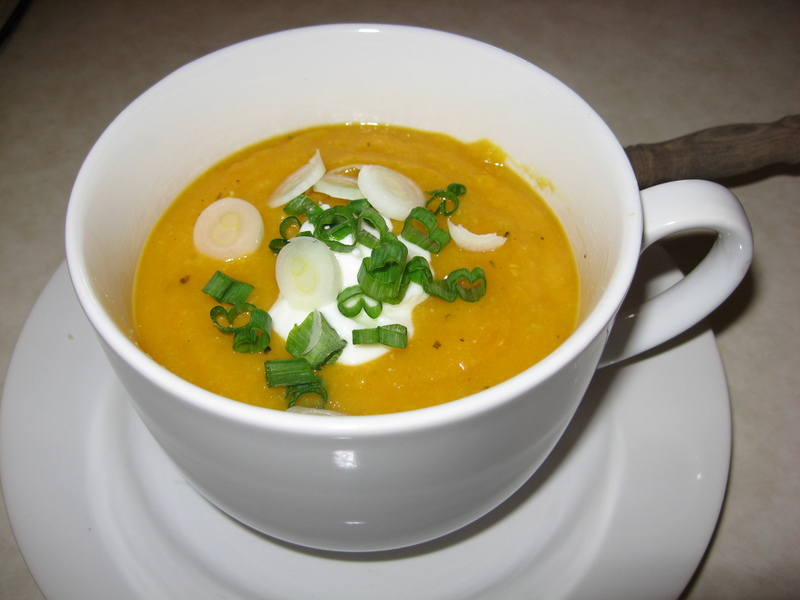 I really enjoy squashes cooked in all sorts of various ways, however, this easy to make “creamy” soup is one of my favorites. Even though I do call it creamy, as you may notice there is no fat in it. There is another variety that does contain cream and butter which is more luxurious; however, frankly, this wintery warm-me-up version fits just right for my belly. Enjoy! Combine the first 6 ingredients in a large pot and place on medium high heat. Bring to a boil then turn the heat to medium low and cook for about 30 minutes—until pumpkin is very soft. Puree the soup in a blender, reheat and add S&P to taste. Top with a generous dab of yogurt and green onion slivers.